M.J. Dixon Construction Limited (MJ Dixon Construction) was established in 1986 and has experienced steady growth while attaining a reputation for quality of work and service. Management’s objectives are to provide construction services tailored to meet individual client’s needs through efficient and effective control of it’s construction projects and budgets accompanied with a team approach in achieving it’s goal of complete client satisfaction. MJ Dixon Construction is CORTM certified with the IHSA. 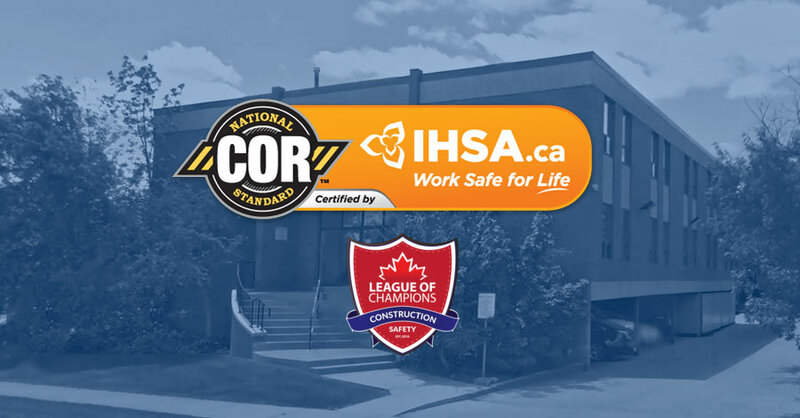 We are also certified with the League of Champions, highlighting the culture of safety in our practice and industry. Active in the commercial, industrial, educational, healthcare and institutional fields of construction, MJ Dixon Construction provides a complete General Contracting and Construction Management Service. Senior Management takes the initiative to provide personalized service to all projects. If you are planning on building a new facility, renovating or expanding your current facility, please contact us at estimating@mjdixon.ca to discuss how we could be of assistance to you in meeting your unique construction needs. From top management to field staff, teamwork moves the project forward effectively. Personal dedication and responsible direction gets the job done right. A client may not always be able to evaluate the cost implications of an architect’s proposal. We bring an insider’s knowledge of costs and an excellent network of professional resources to deliver consistently competitive pricing on a variety of projects. We offer creative thinking on alternatives and options to stay within budget. The firm’s principals are involved directly with each project and this ability to mobilize and manage quickly means value in construction. MJ Dixon Construction maintains a supervisory staff for the project to coordinate and oversee progress of trade contractors. During construction, our team schedules progress meetings to discuss procedure, problems and deadlines and reports to you. We lead not only with individual tasks, but with the entire process. Throughout the life of your project, your company will have the comfort of knowing it has an ally exclusively devoted to your interests. MJ Dixon Construction will assist you and the design team in obtaining building permits and certificates of occupancy and coordinate inspections by required authorities. With ample bonding capacity, we will give you total piece of mind thereby allowing you to focus on running your business.